There is a common thread that ties all of these together — Fully Automated Provisioning**. You can’t achieve the full benefit of any of these advances without Fully Automated Provisioning. In this previous post, we covered the reasons why efforts to harness the power of cloud or virtualized infrastructure will fail without Fully Automated Provisioning. Continuous Deployment suffers from a similar weakness. If you don’t have Fully Automated Provisioning in place, the efforts required to provision your applications and sort out the resulting problems will outweigh whatever benefits you set out to gain. 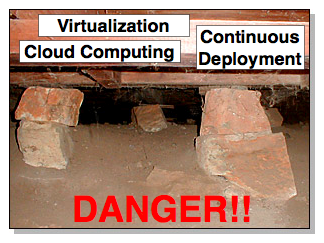 IT automation may not be the sexiest field. However, IT automation (and specifically Fully Automated Provisioning) is the necessary foundation that lets you continually reap the benefits of the latest headline grabbing initiatives. **To read about what the criteria is for achieving Fully Automated Provisioning, check out this blog post and whitepaper.